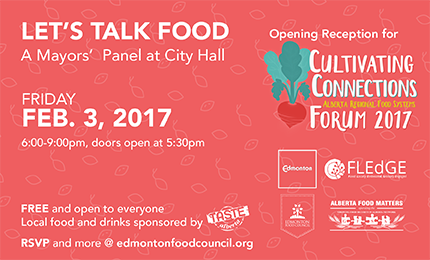 Let's Talk Food, a Mayors' panel was held on Friday February 3, 2017 at City Hall. This panel was the opening event for the Cultivating Connections 2017: Alberta Regional Food Systems Forum. Hosted by the Edmonton Food Council and the City of Edmonton, with partners FLedGE and Alberta Food Matters. As part of the celebration, the Edmonton Food Council paired five local chefs with five local food producers. Taste Alberta sponsored the ingredients for the chefs, who presented dishes using local ingredients. Samples from local breweries were also available for participants to try.